As a parent in Calgary I have fretted often on the question of finding the “best” school for my children. In Alberta we are blessed with many options for schools such as public, catholic, private and charter. This makes the task daunting for any parent. You are probably thinking of schools in Calgary because you are moving here, not happy with your child’s existing school or have a newborn and wondering if you are already late in getting on those much talked about wait lists for schools in calgary. Maybe you have heard of Fraser ratings and wondering what they mean. Have no fear! Sit back, grab a cup of coffee and let’s talk schools in calgary. I’m sharing a detailed guide on Calgary schools based on my personal experience and research. Hope this helps! The scope of this post is from Kindergarten to grade 12. According to the laws in Alberta, three and four year olds are not required to attend preschool. Kindergarten is also not mandatory. However children must start Grade 1 if they are six years of age or older on September 1. Due to capacity issues at popular schools, the best time to get in is however at kindergarten when they have maximum intake. Schools in Calgary can be divided in the following broad categories: Public, Private, Catholic and Charter. Public schools are the largest in number and parents do not have to pay any tuition fees. Admissions to these schools is based on your address. Charter schools are also free to attend however they are separate from the public system, meaning their admission policies are different and school fees might be slightly higher than public schools (but much less than private). Some famous charter schools in Calgary are the FFCA schools (Foundation for Future Charter Academy), Calgary Girls’ School, Calgary Arts Academy, Westmount School, Connect School etc. Alberta was the first province in Canada to establish Charter Schools. Calgary has some of the best Private schools in the province. These schools offer world-class education, in house before and after care and guidance for admissions in university. Webber Academy, Clear Water Academy, Calgary French International School and River Valley School are a few famous Calgary private schools. Strathcona-Tweedsmuir School is in Okotoks but is another great private school accessible for Calgary parents. Private schools charge a tuition fees. Catholic schools operate under the Calgary Catholic School District. Calgary has Islamic schools some of which follow under charters or a different school board. Calgary also has Christian and Jewish school options. Public schools in Calgary are operated under the Calgary Board of Education (CBE). Most Public Schools are typically divided as elementary (kindergarten to grade 6), middle school (grade 7 to 9) and high schools (grade 10-12). Kindergarten in Calgary is half-day (morning or afternoon) except for a few exceptions. Full day school starts from grade 1. Admission to the public schools in Calgary is based on your address. Parents need to provide proof of address in the admission process. Keep this in mind when you are renting or buying and research your school options before you sign the contract. Visit the following link on the CBE website to find the school options available for an address or a community. You can filter by the grade you are looking for. You will also need to choose an option from the drop down menu “View Program Options”, which offers: All Programs, Regular, Advanced Placement (AP), All Boys, All Girls, Art-Centred, International Baccalaureate, various language options/immersions, Montessori, Sports, Science, Traditional Learning Centre (TLC) etc, to name a few popular ones. More details on all these options below. The school year starts in September, so for the 2017-18 school year registration starts in January (This year it starts January 9, 2017). If you are new to Calgary and arrive during the school year you can still start and will be taken into a school that has space. Registration information for Kindergarten to High school, read here. If your child is not a Canadian citizen, read the information here to register for a public school. The regular school option for your address is your designated school. They are required to take your children, unless they run out of space and will assign your child to another school. Your child will be assigned a school regardless. Some popular schools in Calgary are at capacity and do a lottery to have a fair admission intake. Priority is given to siblings and walk zone residents. Lottery results are announced on the Wednesday before Teacher’s convention in mid February. To participate in the lottery you can register in January up to the noon of the day before the lottery. You get no priority by registering earlier or later within the registration time frame. Only a few schools in Calgary have the lottery like Rocky Ridge/Royal Oak, Lake bonevista, West springs elementary, Glamorgan, Willow Park etc and it changes every year based on capacity and interest. All lottery information is here. Check every school’s website for their admission process. Besides the regular options the CBE offers various alternate programs based on unique learning needs of children and their interests. The following link has details of all these options on the CBE website. Montessori: Montessori is a different philosophy of teaching and is best suited for children who are independent and self-directed learners. Montessori is available for grade Kindergarten to six at the following CBE schools: Killarney School (inner city), Captain John Palliser (NW) and Lake Bonavista school (SE). The CBE website has detailed information about characteristics of the program and how to register. Read it here. Traditional Learning Centres (TLC): There are twelve TLC schools in Calgary offering the program from kindergarten to grade 9 in different combinations. TLC schools are famously known around Calgary for their uniform and homework requirement. However there is more to these schools with music being a mandatory part of the program, rigorous academic expectations, french as a second language from grade 1 and eagerness for service. Band starts from middle school. These program follow a method of direct instruction and are at the other end of the spectrum from student-led instruction methods like Montessori. All programs however follow the Alberta Curriculum. Read this section on the CBE website on more details about the program and how to register. Science: The science program is best suited for children who love to view the world through the lens of science. The program is offered for kindergarten to grade nine at the Langevin School in the north and Louis Riel School in the south of the city. The Langevin School is one of the most difficult schools to get into in Calgary, however if you have your heart set on the science program, there is a charter school in Calgary offering a similar program grade 4-9 (More on the Connect School in the charter schools section). Read this section on the CBE website for details on how to register for the science programs. All Boys: The CBE offers an All Boys program for kindergarten to grade 6 with an instructional approach best tailored for the learning needs of boys at the Sir James Lougheed School in the SW quadrant of Calgary. More details about this program here on the CBE website. All Girls: An All Girls program is offered by the CBE at the Alice Jamieson All Girls Academy at Stanley Jones School in the Renfrew community in the NE for grades four to nine. The program focuses on developing leadership skills in girls, providing a broad perspective on non-traditional career options for girls and uses girl-focused approaches to learning. More information about the program here on the CBE website. Arts- Centred: For students with a strong interest in the arts, the CBE offers the program at four schools for grade 5 to 12. More information on the CBE website here. Language Programs: There are many language options available in public schools in Calgary such as: early French immersion, late French immersion, Chinese (mandarin) bilingual, Spanish bilingual and German bilingual. Follow the links about information for each. Advanced Placement (AP): The AP program is offered for grade 10-12 at 13 High Schools in Calgary. Read all about the program here. The International Baccalaureate (IB) Programme: The IB program is offered for grade 11 and 12 at various High Schools across Calgary. Read all about the requirements and details here. You are not guaranteed admission to a program of choice and intake will depend on sibling status, where you live, what grade you want admission in and whether the school has capacity. Since Regular programs are more prevalent and the alternate programs are few in the city, the school might be far away from where you live. Do consider the travel time for your child to and from school whether you drive or they take the bus to school. Schools have a designated walkzone around them. There are special advantages of living inside the walkzone since you might get priority in admission after siblings. However one thing to be considered for walkzones is that they are quite wide spread and children within the walkzone are not offered a bus. So be prepared to drop your child everyday, either by walking or driving to school. Parking around the schools is always an issue. We live in the walkzone of our school and it’s easier to walk to school than drive because parking is always a hassle and far away. Walkzones change often. Latest walkzone information is available on the school website. People have been known to buy houses and find themselves on the other side of the walkzone later. Sometimes schools will take children out of their boundary if they have capacity. This is determined by individual schools after enrollment numbers are in. So if you have your heart set on a school and it’s out of boundary of your area it is always worth a call to the school office to check if they will take children out of boundary. Most won’t offer bussing to such children so do consider this aspect. All information about this here. How much do public schools cost? Public schools are free right? Actually no. There are a few costs associated with instructional supplies, noon supervision (if your child stays at school for lunch), and transport (if they take the bus to school which is not the designated area school). Waivers are available for eligible families. All details here. Starting kindergarten: Red Shirting Yes or No? Under the current School Act, a child must be at least 4 years old on or before March 1 to start kindergarten in September of the same calendar year. This gives parents the option for the child to start kindergarten in the year the child is 4 years old or even 5 years old if their birthday is a few months before the cut off. This strategy became notorious as “red shirting” and viewed as a way for ambitious parents to give their children a head start by being the oldest in the class. However there are pros and cons to “red shirting” depending on individual needs of the child. If you feel your child is not ready for the rigorous requirements of kindergarten because their birthday is close to the cut off, CBE offers you the option to send them the following year. Children can not repeat kindergarten unless there are special circumstances so the child may stay at home or attend a program not funded by Alberta Education such as a private preschool or daycare/dayhome. The new Education Act is expected to take effect for the 2018/19 school year and the regulations expect the child to be at least five years old by December 31, 2018 to start kindergarten in September 2018. Schools have timings that might not match timings for parents who work outside of the home. Some schools have private before and after care options inside the school premises. Parents need to register and pay for these separately. The school office always has information of care options available close to the school. Register for these early, as most have wait lists. Charter schools are autonomous non-profit public schools that provide enhanced and innovative education programs serving specific needs. Calgary has five charter schools. There is high demand for charter schools and these are the schools that have the long wait lists you have heard about. Foundations for the Future Charter Academy (FFCA): The FFCA is really as popular as all the rumors you have heard about it and yes, the wait list is five years long currently. There is a person who has been hired as a Waitlist Coordinator at the FFCA. That’s how popular the school is. Any visitors to a newborn in Calgary, after the initial niceties, ask the parents: “Have you registered for FFCA yet?”. I wish this was a joke, but it’s not. Since it takes five years for the child to reach kindergarten age and the wait list is five years long, you basically have to put a newborn on the waitlist as soon as you get their birth certificate to have a fair chance of getting them in. Unless you have a sibling. Having a sibling moves a child to the top of the list, which doesn’t go well with the ones below, because their numbers keep slipping. On an average a child with no siblings, could slip down 10 positions every year. The FFCA wait list is renewed every year in October. Their cutoff for kindergarten is 6 months later than the CBE cutoff (October 1, instead of the existing March 1, one by CBE) due to the rigorous academic requirements of the program. This means that children born in October, November and December had an advantage over children born in the other months for the same academic year since their parents could put them on the wait list as soon as they were born and they would be ahead of a child born say in July. The good news is that the FFCA realized they had to do something about the wait lists and have decided to move to a lottery system for children being added to the wait list from October 1, 2016 onwards (unless you have a sibling or priority status). The new system will not take effect till the 2022/23 school year for kindergarten (and possibly 5 to 7 years for higher grades) since they have to exhaust the children already in the wait lists. All details about the wait list are at this link on the FFCA website. The FFCA has four elementary schools for all quadrants of the city (SW, SE, NW, NE), two middle schools in the north and the south and one high school in the north of the city. FFCA pioneered the direct-learning and character development approach to teaching that was adopted later by the Traditional Learning Centre (TLC) Schools in the Calgary Education Board. There is obvious demand by parents for the program as evident by the admission interest. Parent involvement is a huge part of the school philosophy and all families have to put in a mandatory number of volunteer hours. The buildings for the FFCA schools have been leased from the CBE. The FFCA does not have resources to manage children with special learning needs or those that require assistance. To put your child on the FFCA waitlist you need a birth certificate, copy of a recent report card (if they are already in school), and a filled in form available here. Follow the instructions to submit your application. Westmount Charter School is a wonderful school to address the learning needs of children who are gifted. It starts from kindergarten and goes up to grade 12. The admission process is different from other schools and starts as early as September (for September starting of the following school year) for elementary (K – 4) and February for September starting for grade 5-12. Parents need to submit a Psychological Assessment for the child to determine if they are gifted. All details on the school admissions link here. Calgary Board of Education also has a Gifted and Talented Education (GATE) program for gifted children at some school locations. The Connect Charter School is a community based on active inquiry-based learning. Their vision is to prepare children to be extraordinary citizens. The school goes from grade 4 to grade 9. They have an extremely long wait list and to give your child a fair chance of getting in for grade 4 you have to put their name on the waitlist on September 15 of the year they start kindergarten. Yes, it takes five years to climb up the wait list. Siblings get priority. All details of registration process here. Calgary Girls’ School is a wonderful place for girls to develop confidence, a strong sense of self and thrive in a collaborative, inquiry-based learning environment. The school goes from Grade 4 to 9 and has two campuses in SW Calgary. All details about the admissions process are here. The Calgary Arts Academy is a progressive public charter school for kindergarten to grade 9, that teaches the Alberta curriculum through arts immersion. The school encourages parents to take a tour of the school before submitting their application. The arts immersion program is best suited for children who have a strong interest in the arts such as music, drama, dance, visual and literary arts. The school emphases academic excellence through arts learning. Parents are an important part of the school community and the school encourages them to learn about arts immersion through information sessions. There is mandatory minimum volunteering of 10 hours per family per school year. Students from grade 4 onwards have to give an audition in an arts forms of their choice for admission. The wait list for kindergarten usually runs two to three years long. All registration information here. Almadina Language Charter Academy has the charter to support English language acquisition for children whose first language is not English. The school has two campuses and goes from kindergarten to grade 9. All registration information is available here. Calgary has many private schools that offer programs from preschool, kindergarten, all the way up to grade 12. These private schools charge a tuition fee for students to be able to attend. Private schools are of two types: registered and accredited. Follow this link on the Alberta Education website for detailed information about the laws and requirements for private schools to operate in Alberta. Private schools have various tuition structures varying from $4000 to $22,000 per year. So there are schools for various budgets. Maria Montessori Education Centre and Master’s Academy are on the lower side for tuition fees whereas Strathcona-Tweedsmuir School is one of the most expensive. For detailed tuition breakup check each school’s website. There are scholarships offered at most private schools. Calgary Catholic School District (CSSD) is the largest Catholic school district in Alberta with 109 schools in Calgary and surrounding areas. The CSSD schools go from kindergarten to grade 12. They empower and educate children through their mission of living and learning from the Catholic Faith. They offer many program options such as AP, IB, fine arts, all boys, all girls and languages such as French immersion, Italian language and culture, Filipino language and culture and spanish bilingual. All details about the CSSD optios here. 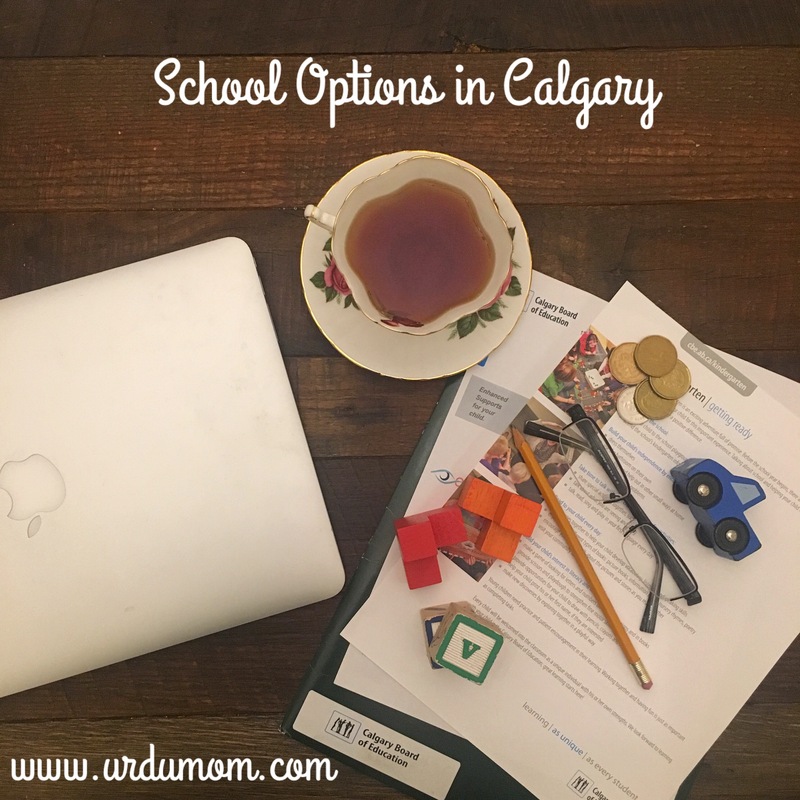 Now that we have gone through all the options of schools in Calgary, the big question is how do you choose one? Many schools have open houses in January and share information about the school. This is a great opportunity to meet the staff and get a look around the school. Ask about class sizes and student-teacher ratios. Have a peak inside the classroom. Can you see your child thriving there? Some schools like the Calgary Arts Academy, Westmount School and Maria Montessori Education Centre have earlier open houses also. Dates for Calgary Board of Education Open houses here. For private, charter and other schools check their websites for open house dates. Not all schools have open houses. Talk to parents who have children going in the school. Do remember that everyone’s experience is based on their unique circumstances so filter all information with that perspective. If you don’t know any parents going in the school, ask on a neighborhood facebook group or check the school council information on the school website. Send the school council an email and they will get you in touch with existing parents. While you ask the parents about things they like at the school, do ask: what is something you don’t like about the school? I feel that I always learn a lot from this question. Don’t we wish that schools came with reviews and star ratings? such as on amazon, google and expedia? How come I can find one thousand reviews about a food processor online but none about schools? This is because education is complex and every school is unique as it applies to your child. It’s impossible to give star rankings to schools because one school might suit one child wonderfully but the other might not thrive in the same environment. However we are humans and love simple answers even to complex questions. Which is why the Fraser report has gained such popularity. Every year the Fraser Institute ranks schools based on the results of province-wide tests. You can compare one school against another or a set and see the trend over the past five years. Below are the top schools in Alberta from the latest Fraser report on elementary schools. This is the information you can view for each school and also compare the school to 6 other schools. For every school you can see the percentage of students with ESL and special needs along with the parent’s annual income. While it’s tempting to get lost in these numbers, do remember that these are based on one provincial test result in the entire year. Some schools do not take students with special needs. Some schools have great number of students who have ESL. Others have programs for gifted children and will naturally have higher scores. Schools in more affluent areas have better rankings since there are many at-home factors at play. Moreover, these provincial tests were not designed for schools to be ranked against each other. These tests are meant for the government, teachers and schools to improve student learning. No teacher I have ever talked to takes the fraser rankings seriously. So do have a look at the report if you’re curious. However don’t base your decision on it. Do your own research and base your decision on that. Link for the latest Fraser report on schools here. The school website is a great source to read more about the school, their mission, latest plans and also the past newsletters. This will all give you more information about the school. Search for the school name on your neighborhood or community facebook group and you might find some conversations between parents about the school. You can always ask yourself also to learn more. Some schools will give you a tour of the school if you request it. There is no harm in asking. Private schools will most always do it, Charter schools maybe and public schools most probably not. The most important factor in your decision must be your child and their unique learning needs. Is your child an independent self-directed learner? does your child have interest in the arts, music or science? do you think your child will benefit in all boys or all girls environment? Does your child have interest in learning a language? Will you child be happy in this school? The happiness and well-being of your child is above any perceived high grades they might get in the future. Maybe your child will not be happy to sit in the bus for an hour and a half each day to attend a far off school of choice when they can walk to a community school near by. They are also likely to find more friends in the neighborhood if they attend the designated community school. Is a certain language immersion important for your family? Can you commit to band practice at your child’s school? How well do you understand Montessori or Waldorf and the expectations from your family? Are you ready for the commitment of homework everyday? Can you set aside the time to volunteer at your child’s school if it’s mandatory? Is faith based learning a priority for your family? Do you understand and agree with the school’s teaching philosophy? Have you read and understood the school’s charter (if you go for a charter school)? Is your child motivated by the arts, music or science? Is your child an independent learner fit for Montessori? Does your child have self-management skills for traditional learning? The school will not change it’s teaching philosophy for your child, so it’s important to fully understand it before enrolling your child. How far is the school from your house? Can you walk there? Will you drive them to school or will your child take the bus? Calculate commute time for your child. A benefit of going to your designated community school is that your child will meet friends who live close by. How much will school cost your family? Besides tuition fees there are other factors to consider such as school fees, family bond, uniform cost, bus fees, fuel cost, child care cost and any other fees the school might have. You might need before and after childcare for your child if the school timings don’t match work timings for you. Schools close not just for summer, winter and spring break but there are many other days off during the year for Professional Development of the teachers or based on the school calendar. Schools have different calendars so have a close look at your school’s calendar to determine your child care needs. Some charter schools have mandatory volunteering requirement per family. Make sure you can manage it and it won’t become a burden later. Don’t underestimate your gut feeling about the school. How did you feel inside the school? Can you see your child happy and thriving there? Drown out the opinions of others and trust your intuition. Registration for majority of schools in Calgary happens in January (there are exceptions to this). You can register for more than one school. For example: your designated school, a couple of charter schools, a school of choice and a private school. However once you are offered a spot, you can only accept one offer since every child is issued a unique Alberta Education ID to eliminate duplication. Do not register just at a school of choice, since you might not get a spot. Some schools will give you time to accept the offer, others might give you just a day. Phew! Now that was a long coffee chat. Hope this blog post helps you. All this information is based on my own research, so please do your own due diligence. Do share any experience you have had with schools in Calgary. I wish you all the best for your decision! A well researched no nonsense informational piece to help all new and old residents of Calgary. Wonderful work Urdu Mom! Very informative and very well written! Kudos ?? You’re most welcome! Thanks for your feedback! Do spread the word pls! Very informative Blog. Thanks for the hard work. You’re most welcome! Do spread the word! Thanks for your feedback! Hope this helps all new and old parents in Calgary. I thought I will share my research with other parents to help them! One thing you should mention: All schools in Alberta are required to follow the Alberta Program of Studies. Schools cannot set their own curriculum. Great point. Will add that. Thank you so much for sharing this information. I am new to Calgary and will be enrolling my daughter in kindergarten for the first time this year. Do you have some more information on Islamic schools in the city? Their process, when do their admissions start,rankings, parents views. etc.? Hello Humaira, welcome to calgary! Calgary Islamic School is quite famous in the city and recently went through an administration change. Their website has admissions information. If you want parents views please message me on Facebook.com/urdumom and I will share some social media threads I have seen as discussions between parents on Calgary Pakistani Ladies Forum on Facebook. That will give you some idea. Hello Shannon, CBE has sports program starting from grade 5-9 at R T Alderman school, Senator Patrick Burns School grade 7-9, National Sports School grade 9-10, Central Memorial High School grade 10-12. Hope this helps! Thank you for such a great article. Do you have extensive information for Calgary Special Needs schools? You’re welcome!! Sorry Valerie i don’t! Was there something specific you were looking for ? Hi, have you done any research on Calgary preschools? I’m really looking for some help as I want to give my daughter the best possible start. Thank you! What would it take for Urdu to be taught in Calgary schools as a bilingual program? A LOT of interest and lobbying by the parents! Almadina also offers Urdu as a language option. You may want to tell readers. Almadina Language Charter Academy offers Urdu from K-9. Following an approved local curriculum based on the International Languages Curriculum as developed by Alberta Education. This is a great opportunity for parents to have their children develop literacy skills. Many parents can speak Urdu, but not everyone has strong reading and writing skills in Urdu. Especially for parents who have been mostly raised here. You can call the school for more information, there is a wait list. My family and I are looking to relocate to Calgary in the next couple months from outside Canada. I have a 4 year old who will need to start kindergarten. I have looked into the public schools around the southwest and northwest areas. I am terrified since I heard there may waiting lists for both schools and out of school care. I am originally from Ontario so the thought of paying fees for schooling and busing mind boggles me but Calgary for us is the better choice. What can I expect when we arrive in terms of finding the right school for our son? Am I going to be running from school to school trying to find a place for him? Also is the noon supervision fee also for kindergarten students? What if I can’t find a school that has space in the walkzone? :S :S :S !! If FFCA is too long of a wait list, do you think TLC would be a good alternative? We don’t have relatives in town, so no one can give us any advice. Your blog is super helpful as I’m struggling with the choice for my twins who are in preschool right now. If TLC would be a good option, do you know where I can find their acceptance rate under the lottery system? And can I also apply for other schools when applying for TLC for them? Many thanks! Thanks so much Urdumama! 🙂 We don’t really have any relatives in Calgary that can ask around, but do you know based on your experience for your daughter, if the school will give more numbers of acceptance to kids in the walk zone or the number of acceptance will be divided up in certain percentage for kids from walk zone and kids from the attendance zone? In another word, if they def give priority to kids in the walk zone and will accept them all before even going to the kids in the attendance area? And just to compare with the regular program, how do you find the TLC program will benefit kids? I saw their ranking isn’t high at Fraser, but scores can be just one of the many methods to measure kids’ actual development at the school. And in terms of teachers, do you find them different from the regular program? Many thanks! My apologies for many questions!!!! Hello there, need ur guidance as we are new immigrants. My daughter has completed grade 8 in another country & looking to join grade 9 here in Calgary. Appreciate ur guidance as we do not want o waste a year of her education by not knowing how to go about the she process. V good read n v helpful. Wish I had read it like in year ago or something. Few things m still confused about. Tlc has many branches, so all are elementary? If yes then after siblings, walkzone is priority right? Like if I buy a Plc near tlc my kid gets in? N it has public school type fees or wht. Glad you found it helpful Bilquis! TLC is for elementary and middle schools. You can see all details on the CBE website. Have a look at your partcular TLC school of interest and see if it gives priority to walkzone. Ours does. But every school is different. Yes, fees are similar to public but bus fees are more (and with Bill 1, bus fees are being eliminated for designated schools anyways but TLC would pay high ones). But if you are near the school, you wont be using the bus I guess. FFCA schools don’t give priority to walkzones. Stay on the waitlist, you never know! Hi, Just wanted to say how helpful this information is….and a little scary aswell. We are moving to Calgary in the summer, and have our visas in process. Am I right in thinking that we wouldn’t be able to register them until we get there, and have the education registration number and address for designated schools? Our kids are currently in private school in Australia, and are quite academic and we are OVERWHELMED by trying to find a good school in a good area. It feels like we might have to just get there, rent in an area we like and then hope for the best! Eek! Most academic public programs like the TLC ones finalize enrolment in February for September, so you might need to look at the next year. Let me know if u need any help. Wow ! What a great review of a complicated education system we have in Calgary. Would love it if you added a small section for single gender schools. I work at one of the newer private schools in Calgary – North Point School for Boy – http://www.northpoint.school. Thanks for the time it took you to develop this guide. I will share it. Thank you for this objective summary of all the schools, wait-list & admissions requirements. Exciting that Calgary offers so many options here. Again, really well written. Thank you so much for the fantastic guide! It answers almost every question, one could have about the complicated education systems of Calgary. In the end, our family choose a TLC school for our daughter going into kindergarten next year. The only problem is she hates the TLC school uniform, and doesn’t want to go to school next year because of it. Since you are already a TLC mom, I was curious if you had any tips and tricks to get kids to at least bare their uniforms. Thanks again. We just moved to Calgary and infact new to Canada as well. We were very much confused with the education system of Calgary and was thinking where to put our 6 year old son. This blog is so informative and clearly written…it’s cleared all our confusion. Thanx a million for such a post and helping a lot of parents deciding the most crucial part of their responsibility. Thank you so much for such a wonderful article. Thanks very much for this excellent blog. I found it super useful. So happy that it helped you! Thanks for the article. Master’s Academy is an alternative program, not a private school. It does have a bond and fees though.